(Newser) – It is a tree? Is it a turd? Is it worth getting upset about? 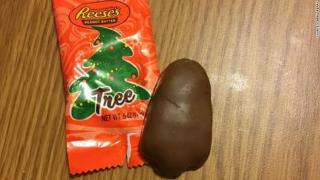 Some say yes to the last and are taking to social media to complain about the blob-like shape of the Hershey Company's latest attempt to make holiday-themed Reese's peanut butter cups, reports CNN—this year allegedly in the shape of a Christmas tree. (Their attempt at pumpkins yielded similar results and were met with similar backlash.) "I have questions," writes one Twitter user, while another poses just one: "What part of this looks like a Christmas tree?" Wow, this is a really important subject. Anyone who is offended by their Christmas Tree Turds--or is it Christmas Turd Tree?--can just send them to me, in care of Newser. I'll be happy to take them off your hands.